After Sue Kellie retired we were asked by several people in the Bath area if we would start an Old Time Dance Group. Having given it a lot of thought, set up, insurance, PPL and PRS licenses in December 2009 we held the first monthly dance for Bath Old Time Dancers. We dance once a month at Saltford Hall and are now one of the largest old time dance clubs in the country regularly welcoming 45/50 dancers. With dancers coming from Stroud, Bristol, Yeovil, Cleveland and Oxfordshire as well as the local area. There is a relaxed friendly atmosphere and we encourage dancers to lead dances if they wish. The dance programmes are mainly traditional old time and we also include some classical sequence dances. 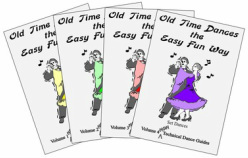 We regularly have Old Time Dance Society members visit us from all over the country. On the Friday night dances the dress code is smart casual, with tea and coffee provided in the interval. The dances start at 7.30pm and finish at 10.00pm.